To catch salmon at any time of the year the presentation of your fly or lure needs to be attractive enough to get a salmon's attention for it to want to come off its lie for a closer inspection! The more a salmon sees of a lure or fly the less likely it is to assault it. When salmon start to hold in a beat and are getting the same old 'repetitive' angling approach every day your chances are slim unless of course a new kid arrives on the block and settles in amongst these older residents for companionship! 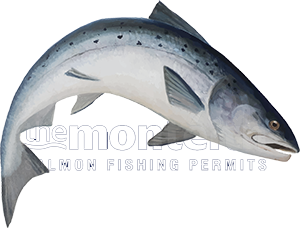 To be successful at salmon fishing it helps to be both reactive to the fishing conditions and observant of current salmon fishing tactics. My objective and personal challenge when on a riverbank and in front of resident salmon that have seen it all is to make one of those open its mouth as anyone can catch the more excitable newcomer! To catch a salmon that's seen it all you need to adopt a 'game of opposites' mentality in your head by completely understanding what salmon are seeing and are 'not' reacting to. Look at what other anglers have been using and blanking with and stay away from these offerings. On the Tay right now given the fact there's low water conditions and a brightish sky I'd bin the normal Spring tube fly sunk line approach and be on a size 9 double with a type 3 sinking tip on a floating line that will fish better in the lower water conditions. Never underestimate a salmon's desire for a smaller fly at any time of the year! The problem is that many anglers only get accustomed to reaching for their floating lines once we get closer to May and wouldn't consider coming off the deep swimming bigger tube flies until then. The point I'm trying to make here is what is the point when salmon are not behaving in trying the same tactics over them and expecting a different outcome! It's like the management in Scottish salmon fishing expecting the incoming adult salmon numbers to increase without doing any significant work on the outgoing salmon smolt populations! Can you imagine just how many lures and flies a salmon gets to see when slowly travelling up the River Tay during lower water which would be enough knowledge to get it a part time job at the Glasgow Angling Centre! To catch resident & difficult salmon that have been trained on their route up river on numerous beats to ignore the offerings then 'logically' you need to come in from a different tactical approach angle to get the salmon's attention. Right now the way the current water conditions are on the Tay is a perfect time for a floating line and a smallish slowly delivered salmon fly. The reason I say this with confidence is because on most Tay beats salmon will not yet have seen that approach so a positive investigatory reaction is highly probable if you do so. Over the years I've taken many salmon on a size 9 during March in low water when salmon are looking at nothing else and I've thrown the 'salmon fishing tactics' book right out the window!